The French version of fresh, heavy cream, it's thicker and more tart. 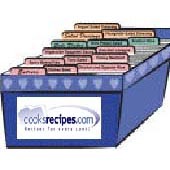 Delicious spooned over fresh fruit or other desserts such as warm cobblers or puddings. It is the ideal addition for sauces or soups because it can be boiled without curdling. Place the cream and buttermilk in a glass container. Let stand, uncovered at room temperature for 24 hours, or until very thick. Stir well before covering and refrigerate up to 10 days. Note: Ultra-pasteurized (sterilized) cream takes considerably longer to thicken than fresh cream.